Now that it’s fall, it’s a perfect time to dig into curries, hearty soups and stews. And there’s nothing better than freshly baked bread to help sop up all that goodness. One rainy dark night with the thoughts of curry already bubbling away in my brain, I decided that naan bread would be the perfect accompaniment. Who cares that I’ve never made it before…how hard could it be? The truth is that naan bread is pretty simple to make. If you can make pizza dough, you can make naan. All the ingredients get a good stir with your trusty wooden spoon and then you let it rest for 2 hours. Take a nap, clean the apartment, turn up your favorite records and have an impromptu dance party! Then, when the rising time is complete, you give it a couple punches, roll out the dough into snake-like lines and pinch it off into small balls. Then you flatten and bake them. The best part is realizing that you’ve baked something that looks almost as good as the naan bread that comes with your lazy Indian night take aways. I say almost because Indian restaurants have large clay ovens to bake their bread and you are probably just making do with a cranked oven from the 70s and a banged up cookie sheet. Or maybe that’s just me. Do you have a pizza stone? Use that instead! Brush with butter and sprinkle with your favorite seed and dig in! Elsewhere: Go make this raspberry vinaigrette that I posted on ReadyMade this week. Seriously awesome and who-put-the-crack-in-that addictive. Stir together the yeast, milk, yogurt and sugar and set aside. In another large bowl, combine the flours, egg, and salt together, mixing well with a wooden spoon. Stir in the yeast mixture until combined and start adding in the water a little at a time until the dough forms into a slightly sticky ball. Knead the dough for a few seconds right in the bowl until the dough becomes a bit smoother. Add a bit of oil to the bottom of the bowl and roll the dough ball around in it, and around the sides of the bowl. Cover the bowl with a tea towel and let the dough rise until doubled in size, about 2 hours. Heat oven to 500F and put a baking sheet on the lowest rack. Punch down the dough and then break the dough into 2 balls. Dust your board or table lightly with flour and roll one ball into a snake, then break into 6 small balls. Repeat with the other larger ball of dough until you have 12 smaller balls of dough. Cover with a tea towel and let rest for 10 minutes. Roll out each ball into an oval shape and add it to the hot baking sheet. Flip the naan bread after 3 minutes. The naan is ready when it’s puffed up slightly and is mottled with golden spots. 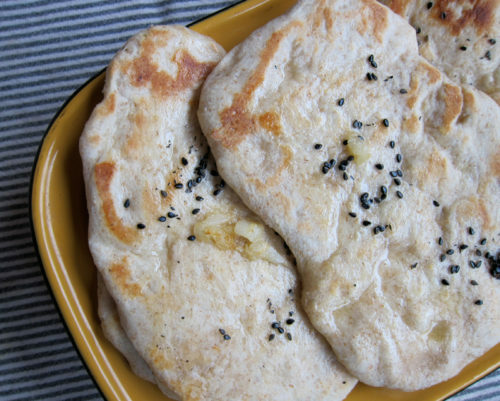 In a small saucepan, melt together the butter and garlic and brush freshly baked naan with the garlic butter and sprinkle with sesame seeds. I will try this! 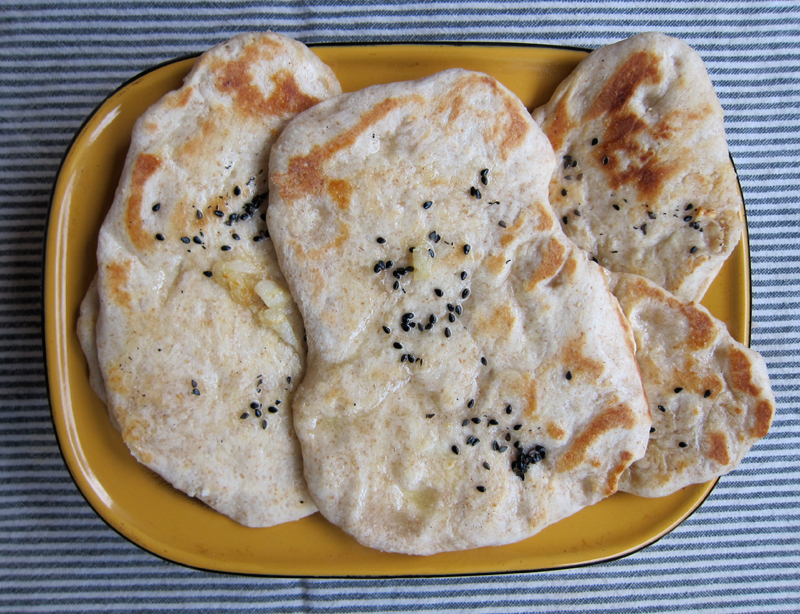 I have been trying to make pita bread, but all my batches come out more naan-like than pita-ish. Also, I see that my oven’s not been hot enough and my pizza stone was on the top rack, not the bottom. Hey -I’m going to try this as soon as i can, but one tiny tiny gripe. It’s just Naan, not naan bread. Naan breasd is a redundant phase IMO. Vishnu, ahhh, the same thing as saying “chai tea” then? Just chai and just naan. Got it! Just made some palak paneer so naan is next! I have been totally thinking about naan lately. My track record with bread is terrible so flat bread seems like a good place to start. Your naan looks heavenly. Naan is basically my favorite type of bread on this entire earth. I love it’s texture…the butter brushed over…the whole package. it’s just delicious! This sounds like a great recipe. gotta love Bittman. SusieBee, I so want to make paneer next! Eva, me too. I love indian food so much. VanillaSugar, ooooh, that sounds good. Olives, yes please! Thanks Elizabeth, I’m really happy that it turned out so well. 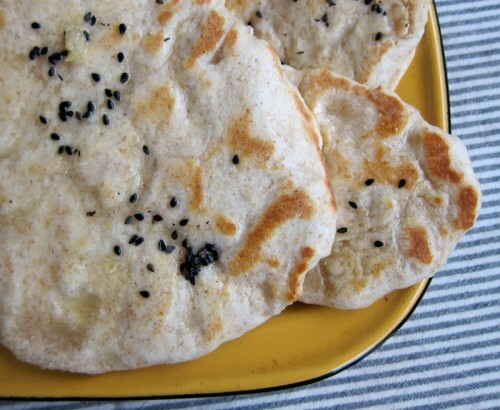 Joanne, naan is so good and this recipe makes it out to be quite simple. Just an FYI, I go to your website many times a month, whenever I need to make something for a party or use up an item in my pantry. Your website rocks! I swear, it has made me so much more of an apple in my sweetie’s eye, thanks to your recipes! Thanks for the reassurance that naan is isn’t too hard to make—I’ve read recipes before that were three pages long, and they scared me off (seemingly) for good. But now you’ve got me thinking about all the delicious naan add-ins and variations that are only possible once you start making your own! LOVE homemade naan. Problem is I eat the entire batch without hardly sharing. Bijoux, this isn’t very ambitious! Try something new and you might be surprised at how easy it is! Maddie, it’s not hard at all. I’m a novice bread maker and this felt totally within my realm. And yes, so many possibilities! Julie, I understand how that is! i made this last night and it was fantastic! i do have one question – when i added the water, the dough was super-sticky and not really a coherent ball at all. after rising it was still too damp to roll out into snakes, and i wound up patting it rather than rolling, but the end result was still scrumptious. i am in humid louisiana so i am thinking that i just need to more restrained w/ the water next time – any advice would be much appreciated! Glad you enjoyed this Julia! Yes, I think you should add the water slowly, bit by bit and stop when it seems right. It shouldn’t be sticky but I’m glad to know that it worked out anyway!! I can make pizza dough! And I’m totally making this naan. I get so intimidated by baking bread sometimes, but this seems doable. And I’m excited about the bonus dressing recipe as well. I’m getting a bit tired of the standard balsamic vinaigrette. Bambinosteps, try both the naan and the dressing. The naan is totally doable and the vinaigrette is amazing!! Yaey I love that you make naan bread seem so simple because I really want to make it but have been scared! Your naan bread looks delicious. Ashley, don’t be scared, it’s quite simple really! Tried this recipe today. Amazing!! Thank you, the naan goes so well with lentil apple dal and my mustard cabbage side dish.